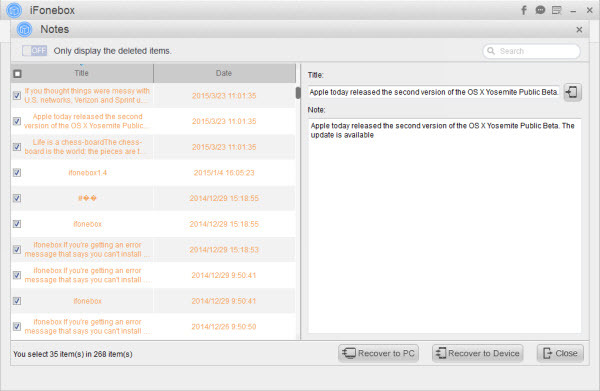 How to recover lost iPhone/iPad data selectively from iTunes backup on Windows? If you want to recover lost iPhone/iPad data from iTunes backup file selectively, you need the help of iFonebox which allows you to select whatever data you need to restore from iTunes backup file. iOS devices like iPhone or iPad plays important role in our life and work and what is much more important than your iPhone or iPad must be the data kept on your iOS devices. You will be very careful when you use your iPhone or iPad in case that you may delete important information. Accident happens from time to time no matter how careful you are. Important data like Contacts, Notes, Calendar, Messages, Safari Bookmarks, Voice Memos and Photos etc may be lost with no good reason. 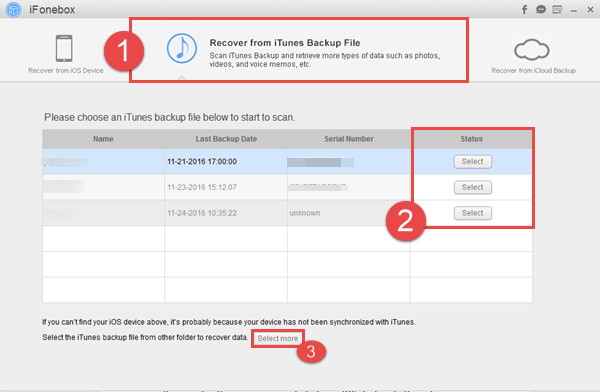 If you have synced your iPhone or iPad to iTunes, you can choose to restore from the latest backup file. In this way, however, you will lose data generated between when you lost data and when you decide to restore from iTunes. To avoid such kind of trouble, you need to find some solution which can help you recover lost iPhone or iPad data selectively. 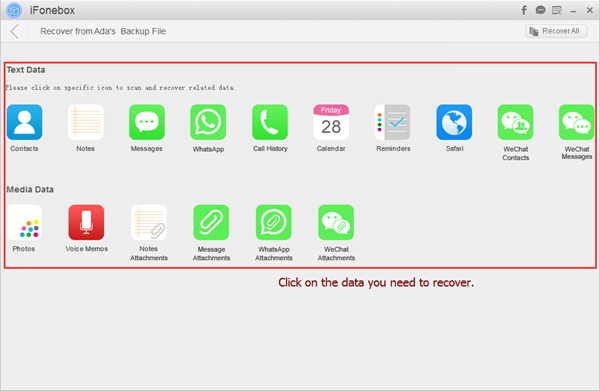 iFonebox is powerful application which caters to your need to recover iPhone or iPad lost data selectively from iTunes backup file. As specialized iOS data recovery software, iFonebox is currently capable of recovering Camera Roll, Photo Stream, Contacts, Messages, Message Attachments, Call History, Calendar, Reminders, Notes, Voice Memos, WhatsApp and Safari Bookmark kept on your iPhone or iPad from the latest iTunes backup file. Besides it works under both Windows and Mac OS environment, while this guide is going to walk you through how to recover lost iPhone or iPad data from iTunes backup file with the Windows version of iFonebox. You can download a free trial version if you want to have a free try at first, but you need to pay for the full version if you want to selectively recover lost iPhone or iPad data from iTunes backup file. Now let’s dive into detailes. Install and run the full version of iFonebox and choose “Recover from iTunes Backup” from the starting interface of iFonebox. You will be brought to an interface asking to select a backup file from a backup file list. Choose the data you have lost to recover by clicking on the related icon. For example, you can click on the icon of Contacts if you have lost your contacts from your iPhone. Take a preview after the lost data has been extracted and select what you need or want before recovering to your Windows based computer.